Giz and I made a split zine! In the second issue of The Triumph Of Our Tired Eyes, I’ve written about hitchhiking from Montréal to Halifax and the three weeks that I spent on Canada’s East Coast during the summer. Almost entirely handwritten (I have really neat printing, I swear) with simple illustrations throughout. If you ever wondered what a zine residency looks like, this is it. I stayed in the shed at the Roberts Street Social Centre for two weeks, then spent a few days in Sackville, New Brunswick for Sappyfest. Read along as I work through my syndrome de la page blanche and punch a dude in the face. 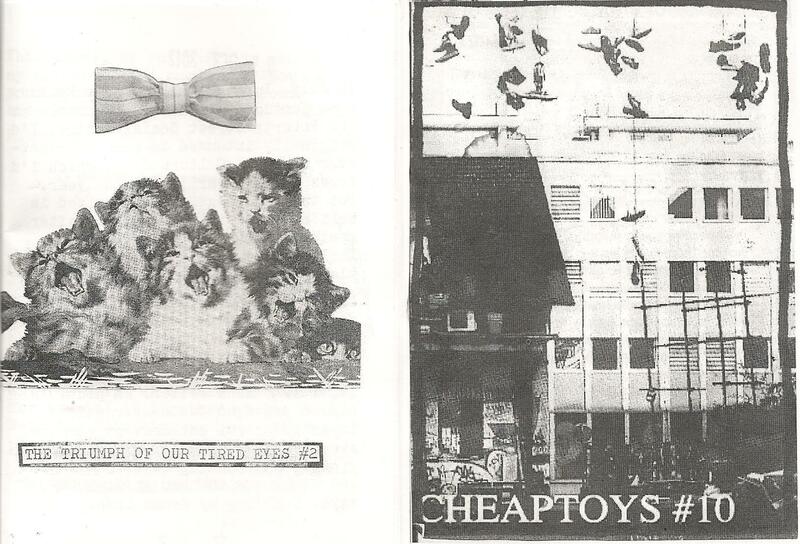 / I’d call Cheaptoys something of a punk-perzine, always full of tour stories and photos from various travels and shows. Giz begins by writing of his experiences in the suburbs of Monaco and Paris, and his desire to leave France for library school. Also documented are his adventures from presenting at an academic conference in Utrecht, Netherlands, to playing Plan-It-X Fest in Bloomington, Indiana (up the scholar punx! ), plus an interview with an anonymous graffiti artist, and more. Il faut remarquer que ce split-zine est écrit en français-anglais, un mélange de langues comme on s’écrit dans nos lettres. (It should be noted that this zine is written in a mixture of French and English, just like we write to each other in letters). It is currently available for $2.00 + postage via Fight Boredom Distro, and is in stock at Bus Stop Press (France), Portland Button Works (US), and Vampire Sushi (UK), and will soon be available at Stranger Danger (US). I accept Paypal and well-concealed cash (just click How To Order). Fight Boredom Distro Updates: Other zines I’ve recently added to the catalogue include Hungry: A (Re)collection of Memorable Meals & Disordered Eating, Radio Antarctica #1, Skinned Heart #3 – #4, Pinch Kid #2 – #3, and the Shotgun Seamstress anthology – and yes, I’ve finally written descriptions! I’ve also just added Well Of Loneliness, a cassette tape by Providence, RI-based queercore crust band Groke. The tapes are baby pink for goodness’ sake! If yr in Montréal, please come see me this Friday! I’ll be tabling with the distro and doing a zine reading at a house show in Verdun, featuring Critical Convictions, Facials, and Vile Intent. Facebook event here.